Data consistently shows that children living in a two-parent household grow up with more financial and educational advantages than children raised by a single parent. There is disputing the fact that a child will thrive when family members put their differences aside and work together to meet the child’s needs. To celebrate the support provided by many parents, August was Child Support Awareness Month. Texas Lawyer General Ken Paxton issued a statement thanking parents who work hard to ensure the needs of their children are met, according to the Cleburne Times-Review. The Child Support Division (CSD) of the Office of the Lawyer General works with both custodial and non-custodial parents to encourage cooperation and provide understanding about the child support process. This is essential training and support when you consider the fact that one in four Texas children are living in a one-parent household. In 2016, the CSD collected over $4 billion in child support payments for the state (a record). Those funds benefited over 950,000 Texas families. In 2017, the CSD is on pace to surpass the 2016 record and provide assistance for even more families in Houston, Galveston, and around the entire state of Texas. As mentioned, the CSD offers training and assistance to custodial and non-custodial parents about the importance of meeting child support obligations. Unfortunately, some parents fail to meet their obligations, which creates financial strain for the family and potential hardship for the child. 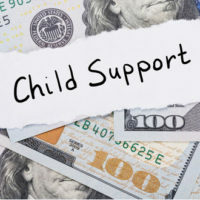 The Office of the Lawyer General even offers resources to overcome difficulties in paying child support, which might include a non-custodial parent suddenly losing their job, losing their home, health issues, or legal difficulties. If a parent continues to fail to meet their obligations, the CSD has initiated a new enforcement program that actually prevents parents from renewing their vehicle registrations if they have not made their court-ordered child support payments in the past six months. The program has proven to be an effective tool in persuading parents delinquent on their child support obligations to figure out a way to fulfill an essential parental obligation — providing for their child, or children. If you think the new enforcement program is harsh, bear in mind that parents behind on their child support obligations receive a notice ninety days before their vehicle registration is set to expire so they have plenty of time to get current on their outstanding support payments. Also, as soon as a payment is arranged, the hold on the parent’s auto registration renewal is released. The objective of the enforcement program is simply to improve overall compliance with court orders to provide support for children. Child support is often one of the most contentious issues in a divorce. We are here to help. When you contact Lindamood & Robinson, P.C., one of our Houston child support lawyers will sit down with you to go over your finances and give you a reliable idea of how much you are likely to receive or be ordered to pay in child support. We will be there for you throughout the process.